LOVING LIFE or Olivia is a seven year old Welsh cross large pony. She is well bred by Loafer’s Lodge Spring ahead. Olivia has a PERMANENT CARD at 14.2. 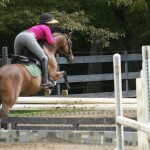 She is a good mover and jumper with great barn manners. She has been show lightly at local ETHJA shows (see video below), twice in the Children’s Pony in 2013, and in the LARGE GREEN PONY division ONCE in May of 2014. Her GREEN may be REINSTATED for next year. She is QUALIFIED for the 2014 Pony Finals in the LG GREEN division. Olivia should be a terrific large pony with her good looks, top of the line size, age, experience and quality. See a video of Loving Life below at her first horse show. Halloween is coming. Start planning your costume for the Costume Class at the 10/28 show.